"Why," he groaned sleepily, "did I ever let myself be talked into playing chauffeur for a bevy of females?" "Because one of them has bee-yootiful hazel eyes! And it isn't me!" And she dashed out into the hall so fast that the pillow Brian hurled missed her. 9. "Bob-Whites to the Rescue"
When Trixie and Honey decide to collect herbs to replace their teacher's damaged collection, they discover Martin's marsh and the strange old woman who lives there. 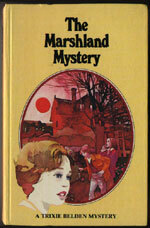 The mystery develops when a blonde child prodigy, staying with the Wheeler's, mysteriously disappears. 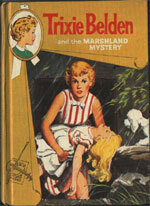 A nuisance reporter suggests a kidnapping and the hunt turns to Martin's Marsh where Trixie meets Miss Rachel Martin and learns the mystery of Martin's marsh. Gaye is found but questions remain unanswered as Trixie and Honey try to help an unhappy child and stop Miss Martin from being evicted from her home. 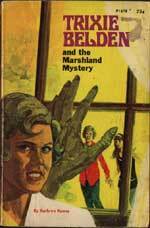 No real villains in this story, but Paul Trent, the reporter, becomes an enemy of the Bob-Whites, and Miss Della Crandall, Gaye's aunt, is despised for most of the story. Events begin in April. Trixie is only a few weeks away from her fourteenth birthday. Honey is said to be thirteen too, but a few weeks younger than Trixie and Di (p. 16). 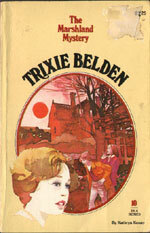 Trixie's birthday is on May 1, which is when the book concludes. Dan does not appear in this book, despite it being set in Sleepyside. He is mentioned a few times. He was said to 'have come from the city under a cloud of suspicion but, due to Trixie's detective work, he was cleared' (p. 18) which is ironic seeing Trixie was the one who suspected him all along. Trixie seems to be jealous of any other blonde around and is quite disturbed by Bobby's crush on Gaye. Paul Trent apparently went to Central High School. Could this have been in White Plains? Jim is said to be catching 'up on some of his load of senior homework. He was taking two extra subjects, preparing for his entrance to college in the fall' (p.76). Brian refers to Trixie and Honey as kids several times throughout the book. The Wheelers are said to have assistant grooms and the gardener's name is Mike. Is this Nailor's (#3 Gatehouse Mystery) first name, or do the Wheeler's have a new gardener? 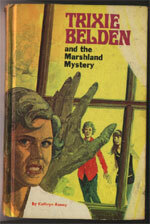 Mrs Belden is finally named in this book, although her name, Helen, is only mentioned once by Peter Belden (p. 168). 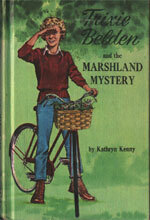 Up until now, she had always been just Moms or Mrs Belden. 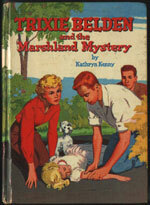 However, her name is only included in a later oval paperback version of this book. 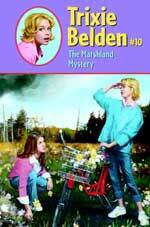 Helen originally wasn't named until #20 The Mystery Off Telegraph Road.